Started in 1998, by the Scottish Rootes Enthusiasts, the Moffat car rally has grown to become one of the biggest 2 day classic car events in Scotland. 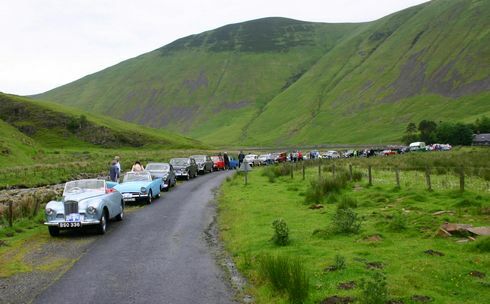 Set in the beautiful Moffat hills, the rally is an incredible place to both exhibit your cherished classic or vintage motor car and is a wonderful visitor experience. The rally accommodates 900 entries some of which come hundreds of miles to participate. This 2 day event has a drive through the Moffat hills on the Saturday which is a glorious sight and Sunday is the main gathering in the Moffat showground, with a large display of classic cars, auto-jumble/trade stands and childrens entertainment. The Rally continues to raise money for the Macmillan Cancer Support and other cancer charities. Many of our families, friends and fellow classic car enthusiasts are touched in one way or another by cancer and this helps our major fundraising efforts for this great event. Classic car fans and many of the entrants will be travelling from Europe, some down from the Shetland Isles, many from Northern Ireland, Wales as well as Kent, Cornwall and Dorset to take part in this amazing 2 day event. 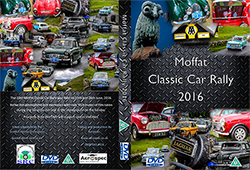 The 19th Moffat Car Rally was held on 25th and 26th of June, 2016. Relive the atmosphere and memories with over 35 minutes of film taken during the Saturday run and at the showground on the Sunday. Proceeds from this DVD will support cancer charities. To order a DVD please download and print the order form then return it with a cheque or postal order.